The occupation of Iraq has helped al-Qaeda recruit more members, according to the London-based International Institute for Strategic Studies. The influential group's annual report says the network has reconstituted itself after losing its Afghan base. 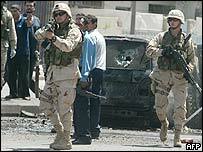 It adds that Osama Bin Laden's followers have set their sights on attacking the US and its close allies. They would ideally like future operations to make use of weapons of mass destruction, it reports. The institute quotes conservative intelligence estimates as saying that the group has 18,000 potential operatives and is present in more than 60 countries. Recent attacks in Spain, Turkey and Saudi Arabia show its renewed strength, it says. The report finds the network's finances are in good order. The institute says the war in Iraq has focused the energies and resources of al-Qaeda and its followers, while diluting those of the global counter-terrorism coalition. It has split the US and its major continental European partners, leaving Britain - Washington's staunchest supporter - uncomfortably in the middle. US forces in Iraq present al-Qaeda with what the report calls its most attractive "iconic" target outside the US itself. And it concludes that if Iraq were to become a failed state or revert to dictatorship, it would be a "strategic nightmare" for the West. "It is key to regional security - and the stability of the international system - that the US and its allies get Iraq right," the report says. The report also addresses the broader issue of relations between Islam and the West, saying the Bush administration did not fully appreciate that the 11 September attacks were a "violent reaction to America's pre-eminence". To win hearts and minds, the report says, the appearance of American unilateralism needs to be tempered.